Every day I realise that I’ve learned something new about teaching, and at the end of each day I realise that things are getting more fun and a lot easier. I’ve also realised that I am always really, really exhausted at the end of each day, and it’s a whole new kind of exhaustedness. Probably because I’m on my feet all day long and and I’m always talking in a voice ten times louder than I would ever speak in normally and even when I’m not in class, I’ve either got little kids climbing on me, surrounding me or yelling hello at least 10 times each, which of course I feel obligated to respond to every single hello I hear…. Also, even though it’s still only the 2nd week of school, I’ve come to the conclusion that all my classes are wonderful except for the 2nd graders. There is absolutely no hope of not wanting to pop every little 2nd grader’s head off at the end of each class. This week it was so bad that I had to run and get a Chinese teacher to come in and help me make them be quiet. Sure enough, the second that teacher walked in the room, the kids all sat down, shut their mouths, stopped hitting each other, stopped climbing on things, and neatly folded their hands in front of them. The teacher hadn’t even opened his mouth yet!! And the second he walked out, the class plunged into chaos again. I’ll have to think of something soon…..
That aside, Thursday was Teacher’s day in China, and in the morning Cindy called me and told me to come to her office to get two ‘Hong Bao’, or red envelopes with money inside from the school, one for me and one for Craig, with 200 kuai inside. Pretty gooood! Then Monica called and said that we had to go to the special dining room at school because there were two American men coming for lunch, and me and Craig should dine with them because we were also American. I expected two business men in suits to be there, probably to make some deal with the school or headmaster (who I haven’t ever seen). Me and Craig went up there and sat down in an empty dining room for 40 minutes, then the door opened and in piled 3 generations of a Chinese family who were relatives of the woman who owns the land the school is built on. Apparently the only American was this 18 year old son of a woman from Liuyang who had lived in Taiwan for a while, and now lives in Irvine, California. It was kind of a weird lunch, because there were two sets of grandparents who kept dozing off in their seats, while one guy kept pouring Craig some baijiu (60 proof rice alcohol) and another lady kept protesting, saying he had classes after lunch and couldn’t be drunk, while I talked about cadavers and fake military exercises with the younger American kid. Anyway, the food was good, and I went to class pleasantly full. After my last class, Monica called me again and told me and Craig to meet her in her office as soon as possible because all the teachers were going out to eat and then to KTV (karaoke), courtesy of the school. 12 teachers piled into a 7 seat van and we drove to a local restaurant to have dinner. I sat down with Monica and Craig but some of the teachers came over and asked me if I would sit at their table, and all the teachers kept laughing and pointing at different male teachers, teasing them that they were the ones that wanted me to sit at their table. I was having a little trouble speaking Chinese, because I was missing a lot of the words I wanted to use, so the guy next to me thought I couldn’t understand very well and was going on to the guy on the other side of me about how fat Americans are. I laughed and nodded at him, and he got really embarrassed and said ‘oh no oh no!! i thought you couldn’t understand, oh no! !’ I thought it was really funny and kind of felt bad that he was embarrassed! After that Monica said there was no room in the van going back to school, so we would just walk into town. It was going to be a very long walk, so three of the teachers that had been at the dinner were going past on their mopeds and had us all hop on the back. I got on the moped of a teacher named Selina and we all went into town to wait for everyone to get to the KTV place.We had a few hours to kill so Selina said I could try to drive her moped in an empty area. The last time I drove a moped was Helen’s in Taiwan, in a park for 10 feet when I was 15, and drove horribly, but this time I did pretty well. She said I could borrow her moped any time I want since you don’t need a licences to drive one in China (no wonder there are so many accidents involving mopeds…) but I think I’ll have to pass on that. We rented some double bicycles and rode around on the closed off street next to the Liuyang river, then got back on the teacher’s motorcycles and went to KTV. The room was enormous and full of teachers from Xinwen School. Apparently there were 2 other rooms rented for our school for teacher’s day. When I got in there was an old guy singing extremely loudly to some old Chinese song, and after that the music teacher at the school sang a bit, and everyone would order songs and sing them one after the other. Me and Craig tried to sing ‘Hotel California’. Craig did much better because I don’t know the words and I’m too shy to sing in front of anyone, but it was a fun time anyway. After teacher’s day there was just one more day of school left until the weekend so me, Craig and Michele were planning to go to Changsha for the weekend, to see the city and meet another Buckland teacher (Katie, my roommate in Yangshuo) who was coming to Changsha to get a new cord for her laptop. 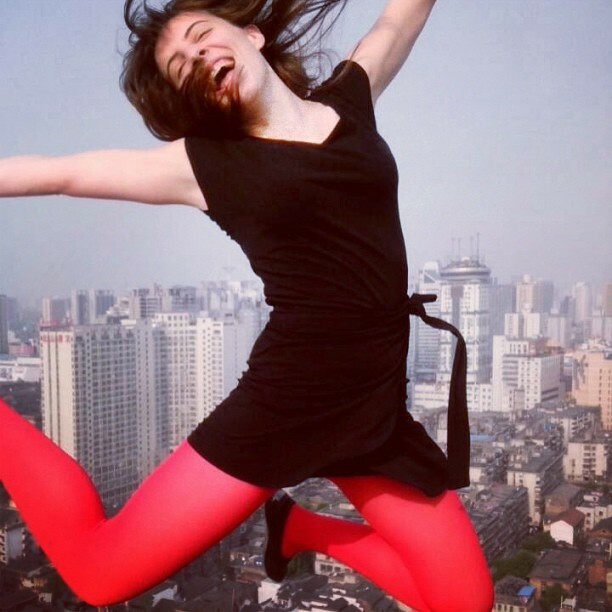 Michele teaches for ‘World Teach’, which has it’s main branch in China based in Changsha, so there is a group of about 20 foreign teachers in her group teaching and living in Changsha. One of Michele’s friends (Courtney) had agreed to let us stay in her apartment for the weekend, which was great because that’s about 80 kuai that didn’t have to go to a hostel. Me and Craig met up with Michele at Liuyang’s bus station and got on a bus that was about to leave for Changsha. Apparently with local buses you can just get on and pay for the ticket then. It was only 25 kuai and it got us to Changsha’s east bus station in an hour and a half. We took a cab to Courtney’s school, which ended up being on the other side of the city, and soon discovered that Changsha was probably going to be a lot more expensive than our little tiny ‘town’ of Liuyang. The bus cost us 25 kuai to go from city to city, but the taxi cost 38 kuai to get from the east station to Courtney’s school. Changsha is HUGE, and there are ZILLIONS of people. Liuyang seems empty and serene compared to Changsha. At night in the busy districts, you basically just have to shuffle along the sidewalk because there are so many people. After So-Ho, we followed the teachers to this guy’s apartment that was in a high-rise, so there was an awesome view of the city. It was getting light out by that point, and everyone was really tired, so after a few beers and good talks and some noodles, we all dispersed and me and Craig followed these girls back to their apartment because they said we could sleep on their couches. By 12 noon that day, I had woken up and so had Craig, but the girls hadn’t, so we just wrote a thank-you not on their table and taxied back to find Katie, Michele and Courtney. That afternoon we went to eat at China’s Pizza Hut. The pizza was really really good, but since I’ve just been eating rice and veggies and little cut up meat every day, it felt way way too heavy and thick. Every time I eat western food, I crave it less and less. I feel way better eating Chinese food, and it has so much more taste and variety…. After that we went to Carrefour to see what kinds of things they had, then went to a pirated DVD store where I found some anime for my sister Lulu and two movies that came out to be less than 6 US dollars. It was kind of late when we had finished walking around and we were hungry again, so we went to a tofu restaurant where Mao had supposedly eaten on his visit to Changsha way back in the day. There was a big Mao-bust in the doorway, and a bunch of pictures of him all over the wall, as well as a giant red communist star. The food was really really good, and fixed my stomach after eating that thick, greasy pizza. The last stop we made that night was to this German place called ‘Metro’. It’s basically like Costco, and it’s full of foreign products. Everything is really expensive, but I decided to get some Nutella, cinnamon and pasta and pasta sauce. I’m gonna make Monica and me and Craig and some other teachers a pasta dinner maybe, if I can get a hold of somewhere to make it. I went to sleep on Courtney’s floor that night, and in the morning we all ran to our bus stations and caught our buses back home. We made it back just before the onslaught of noisy students return to school in the afternoon. The rest of my teaching week went rather well, since I didn’t have any more classes of 2nd graders!! On Thursday I had two classes of 5th graders before lunch and a class of 1st graders after lunch. Since the 5th graders are the highest grade that I teach, and I already taught that one class on Tuesday, I wasn’t worried at all about them. On Wednesday night I re-planned my intro lesson to fit what I thought might work for the 1st graders, trying to ignore that deep fear in the pit of my stomach that they might be even worse than the 2nd graders. I made a power-point with everything I could think of, and all kinds of easy songs, the full alphabet with lots of pictures, etc., and tried to get a really good nights sleep. The next morning I woke up and went off to teach the 5th graders, which went really well. They liked all the games, played them well, and didn’t get too noisy. After a few days I’ve kind of got the classroom commands in Chinese down pat, so if things start to get out of hand, I can nip them in the bud in a language the kids understand, which is a VERY big help. After the two 5th grade classes I had three hour break to think about the 1st graders. After lunch I went to find class number 28, full of 1st grade kids. When I walked in, I was amazed at how much smaller these kids were than any of the kids I taught before. When I walked in, some of them crowded around me and were asking me questions in Chinese and whispering to each other. When the bell rang, they all ran to their seats and sat quietly and waited for me to say something. I said, ‘Hello!’ and they all responded, wide-eyed and in unison. The whole period went amazingly well, and these little kids were so cute and well-behaved. I swear something horrible evil must happen between 1st and 2nd grade……maybe they get comfortable in the school environment and start testing everyone’s limits? I hope they stay this good all year! The only awkward point in the lesson was when a little kid started crying for his mum and then I went over to pat him on the head and tell him it was ok, then another little girl started crying and it kind of caused a domino effect…..I had to go get a teacher in the office and ask her what to do. She just stormed in and yelled at the kids to shut their mouths, dry their tears and start paying attention in class. The kids sobered right up and were fine for the rest of the class. I don’t think I could bring myself to yell at a little 6 year old who is crying for his mum, but I guess it’s kind of necessary since the kids spend five nights a week at school, and they either get used to it or have a really hard time. They’ve got to realize early on that they are going to be doing this all year long. So after that class ended I just went home to hang around for a while when Monica gave me a call and suggested me and Craig go meet her downtown because it was Ghost Day in China and we ought to do something special. So me and Craig started the walk down the dirt road to the big tarmac-y road to look for a taxi. For some reason, there were no taxis in sight so we walked and walked and walked, and finally we saw a taxi go by so we tried to flag it down, but it kept on going. A guy on a motorcycle, who had his baby son balancing between his legs on the front, stopped and told us to hop on. I pointed at Craig and was like isn’t he too big? Do you mean both of us? And the guy nodded and said ‘Hop on! Hop on!’ So Craig climbed on first, wrapped his arms awkwardly around the guy’s waist, then I perched on the back edge of this guy’s tiny motorcycle and away we zoomed, all four of us, down the big road, right through a stream of heavy traffic, and into the downtown. The motorcycle kept sputtering and I thought it was going to fall apart, but somehow we made it all the way downtown, all intact! We just hopped off and thanked the guy, wondering if we should give him something in return, but he just drove off. I was giggling like mad the entire way, and I felt like I was in one of those pictures you see of India where an entire family of 10 is balanced on one moped. Anyway! We got downtown, met Monica, and walked around for a while, talking about Ghost Day. She told us that on Ghost Day the Chinese burn special ghost money that the ghosts can use in hell. Me and Craig wanted to burn some with her, so we went to a Buddhist shop along the river and bought some ghost money, complete with the words ‘Hell Bank Notes’ spelled across the bottom. We took the money and went to find a good spot to burn it. There was a little stone dock that you could climb down to right on the Liuyang River where boats were tied. There was a man and his daughter down there burning piles of ghost money, and lots of piles of already burnt money everywhere. We found a clear spot and Monica instructed us that we had to burn the money in groups of three. We peeled off each sheet of money, gathering three together, lighting them and throwing them in a pile. While doing this we had to talk to the ghosts, telling them we are giving them money and that we hope the can use it to get into the afterlife, or to go to good places, or to wish their crimes away. When we had burned all of it, we sat watching the embers die down, said the last bit to the ghosts of Liuyang and climbed back up to the road. After that we just walked around a bit more then went to a juice bar to have some tasty juice. The next day I had 1st graders all day. Again, all those classes were quiet, well behaved and great to teach. They loved all the pictures I had on my power-point, and the kids who knew the English words triumphantly would yell them out as loud as they could. I had one class after lunch, right before all the kids would go home for the weekend. Normally the first class after lunch is at 2h35, so I was taking a good old Chinese afternoon ‘xiuxi’ (siesta), when I heard some frantic knocking at my door. It was only 1h30 so I wondered what was going on. I ran to the door and Craig yelled through it ‘Aimee! We have class early on Fridays! We are supposed to be teaching right now! Classes started at 1h15!’ and he ran off to his class. I quickly got everything together and ran as fast as I could through 100 degree heat to my class as well. When I got there, Cindy was apologizing, ‘I’m sorry! We forgot to inform our foreign teachers that Friday’s after lunch class is earlier! Please forgive us!’ I was thinking that it was my fault, so I kind of just apologized as well and ran into class, jumping right into the lesson. I think the 1st graders were happy to have a 20 minute lesson instead of 40, as was I! After that, I was done for the weekend even before 2h30 when I thought I was supposed to start! On Saturday we met up with another foreign teacher who teaches at a school called TianJiaBing about 20 minutes outside of the city. Her name is Michele and is from Somerset, Mass., really close to Connecticut! It was good to hang out with another westerner, where we can all talk English at our own speed. She might come with me and Craig to meet Katie in Changsha next weekend, which should be really great! That’s about it up till now. Tomorrow I have all 3rd grade classes, which begins a whole ‘nother week of teaching……maybe I’ll be half a pro at the end of this week?? P.S. I’ve inserted pictures into this blog entry….I hope it works because I have to post by email because Word-Press is blocked in China…. The school year has finally started! On Monday night around 9h30pm I finally got my teaching schedule for the semester, which was to start at 8am the following morning. I ran to find out which buildings the classes were in, then ran home and threw together an intro powerpoint that I hoped would work for both 2nd graders and 5th graders. It was basically made up of my self introduction (my name is miss lamb. do you know what a lamb is? ), hello, how are you, what is your name…things like that, and making name cards to put on thier desks. I also had a game in there where they would pass around a little knit lamb I have while I played some music and when the music stops, that person has to get up and say ‘my name is blah blah’ and the class would have to answer ‘nice to meet you!’. On Tuesday morning I woke up, went over my lesson one more time, and zoomed off to my first class of 2nd graders. I got there about 10 minutes early and was mobbed by little 2nd graders yelling things to me like ‘you’re a foreigner aren’t you? look everyone! its a foreigner with a big nose! !’ ‘will you be our oral english teacher?’ ‘are you from england?’ ‘are you Anthony (the previous foreign teacher)’s wife?’….yes little children, I am a foreigner. Yes, my nose is rather protrusive. Yes I am your oral English teacher. Please don’t go through my bag, wait for class. Sit down. No, I am American, and I have never met Anthony (An-Dong-Ni) even though he is American too. Not all American’s know each other. You get the idea!! So finally the bell rang and I had my powerpoint all set up, and I spent the next 10 minutes trying to calm them down and get them to sit in their seats. Then spent the next few minutes introducing myself and having them repeat back to me ‘What-is-your-name? My-name-is-!’ They soon got bored of that, so I had them play the ‘Stand-Up, Sit Down’ game. In this game I teach them the words ‘stand up, sit down, jump up, turn around’ and then have them follow my commands and see how fast they can do it. This first class of 2nd graders seemed to like it, though instead of tiring them out, it just got them more excited. I decided against doing the ‘pass-the-lamb’ game, since I didn’t think the results would be very good. Finally the bell rang and I had 40 minutes till my next class of 2nd graders. At this point I was thinking, ‘Oh, well this isn’t so bad! I can do this! !’, so I went to my next class of 2nd graders. Let me just say this class was a complete disaster. Absolutely nothing got done, and I had to put a kid outside of the classroom with his chair. Basically all the kids on one side near the windows were running around and when i would get some to sit down, the others would already be up and running accross the room to hit one of their classmates, then the classmate would get up and run to hit them back and throw things at them and whip them with their jackets. The kid that I put outside was hitting his neighbors with his jacket, so I took his jacket and put it at the front of the room. 10 minutes later he ran up and grabbed it and starting whipping the nearest classmate with it. I ran over grabbed it, and banished him. The other half of the class was a bunch of little girls, some sitting with hands folded and wide-eyes (they got more well-behaved the more they saw the boys badly behaving, and kept looking at me to make sure I knew it). The rest of the girls and boys in the class were drawing and sleeping and wiggling and whining. The bell rang and I realised I had got nothing done except for made a few kids shout hello, how are you, what is your name a few times. After that, I was incredibly discouraged but trudged off to my class of 5th graders. This class was a breath of fresh air. Although they were still a little noisy, they knew how to sit still, knew that they weren’t supposed to run around everywhere, and could understand a little English which made it a little easier for me. They really liked the ‘stand-up, sit-down’ game, and when I said sit down when they were already sitting down, they all laughed histerically. I decided I would try the ‘pass-the-lamb’ game, and that also worked really well, though towards the end the lamb was getting thrown clear across the room. I felt pretty good after that, though very tired. It was lunch time after that, and I slept until 2pm. Anyway, I slept well and woke up the next morning refreshed and more optimistic about the coming day because it was all going to be 4th grade classes. As I thought, the day went really well, and the classes I had were all really, really well behaved and easy to teach. I even tested out some new games on them, which all went smoothly, and I learned to relax a little about the noise level. I figure so long as about 1/3 of the class is paying attention, it’s a huge success. I also got a lot of kids saying ‘THree, THere, THis’ instead of ‘Sree, Zere, and Zis’. I also learned which classroom words in Chinese work, and what the student’s teachers usually say to get them quiet. It’s good for my Chinese, and it seems to help them understand what’s happening in class a little better, so they are more likely to pay attention. I have 4 classes before lunch on Wednesdays and then I’m done for the day. This afternoon was great, because I was able to rest up, re-do some of my lesson plans, and think about the next two days (all 1st grade classes). It’s only been two days and already it’s getting easier and I’m seeing what works and what doesn’t, and what can be improved. I think the first few weeks are going to be hard, but once I get some sort of regular class structure, it’ll be super easy. Oh yeah, I almost forgot!! I found out my old Austrian friend from Taiwan is living in Beijing until November. So if circumstances permit, I might take a trip up there over the National holiday on October 1st. If that doesn’t work out, I’ll be going around Hunan, to Zhangjiajie, Heng Shan, and Mao’s Birthplace probably.